List Auto is a Canadian used-car dealership similar to Carvana of the U.S.
A Calgary startup is selling collision-free used cars online, seeking to earn trust, and making its bread and butter on restructuring buyers’ automotive financing. List Auto, which launched in March, is the only service of its kind in Canada, said Alif Bharmal, the company’s founder and finance director. “From start to finish, [buyers] can do this from the comfort of [their] own home,” Bharmal said. All transactions are done online. Bharmal conceived the concept for List Auto and then learned it was similar to Carvana, a U.S.-based online seller of cars. He reached out to Carvana to determine whether the company was interested in expanding to Canada, but was told its focus was on the United States. 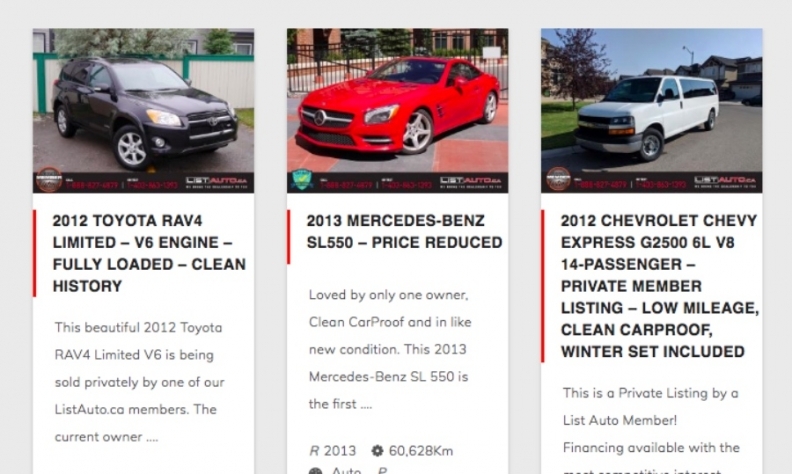 List Auto’s sales inventory is sourced from four Calgary dealerships and a car-rental company. All vehicles are certified as collision-free. “It increases the trust level and follows our model of transparency,” Bharmal said. “If all you ever have are accident-free vehicles on your site, then the question never comes up. We’ve seen a lot of news stories where people buy vehicles and the accidents were not disclosed. We’re ...trying to change the look of this industry as trusting and transparent. With our partnership with [vehicle-history company] Carproof, and technology, we are able to ensure that vehicles are accident-free. The second way is a thorough walkaround by our sales manager, who has been in the industry for 12 years. List Auto makes its money on financing with lending institutions if the purchasers don’t have the cash to buy the vehicle outright, which is usually the case. List Auto also markets vehicles for sellers and,similar to the traditional buying process, makes its money if financing is involved. The company also has a service for refinancing vehicles, either by lowering the interest rate or extending the amortization. The loans are fully open with no restrictions, said Bharmal. Bharmal has a background in sales and finance at three dealerships and experience as a mortgage specialist. To comply with the Alberta Motor Vehicle Industry Council, List Auto has a Calgary business location in the Avenida Auto Centre where all the mechanical inspections take place. The company uses vans to transport vehicles to customers. Bharmal said his company has brought the car and housing industries together so that people aren’t prohibited from buying either because of bad credit or loan challenges. “We match you up with one of the big five banks, and they will work with you to help you qualify for a standard loan” he said. “We will put [buyers] in with our rental partners for a rental vehicle for that same kind of rate that’s going to be needed to rebuild[their]credit or to get [their] credit to a certain level. So, [buyers] are spending money over that time, but [they’re] not stuck in a vehicle” at high interest rates. List Auto uses videos as informational tools for its service. Its pitchman is Bharmal’s partner Rob Maver, a punter with the Calgary Stampeders of the Canadian Football League. Bharmal knew Maver, who has a background in sales, through associations with past and current Stampeders’ players. Maver said he relished his new role. “Life throws things at you, but whenever you are presented with an opportunity, you should definitely take advantage of it and see what can be, and that’s happening right now with List Auto,” he said. The company also has a sales manager, COO and videographer.